I am using dotTrace Profiler 3.1 64 bit application. When I am trying to use dotTrace with our Application, ie, a Windows Service application, it always shows "connecting" status. 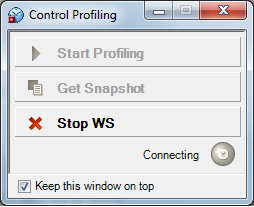 The "Start Profiling" button is disabled. When service status was running. Hi, it may be the effect of other profilers (like ANTS or VS 2010 integrated profiler) that were installed on your machine. Please contact me (alexandra.rudenko@jetbrains.com), and I'll send you our cleaning utility.